Flat roof installation may seem pretty simple, however it is something that is best done by a professional Flat Roofing Toronto contractor. The components used in flat roofing are very durable, readily available and inexpensive. The trick to having a lasting flat roof system is applying them with the correct method and in the right order. A professionally installed flat roof system can withstand fire, extreme weather and can last up to 20 years. Flat Roofers Toronto is a licensed, bonded and insured professional roofing contractor serving the Greater Toronto Area for over 18 years. We provide roofing services to residential and commercial properties in the area including Brampton, Mississauga, North York, Vaughan, Pickering, Ajax, Newmarket, Richmond Hill, Aurora, Etobicoke, Markham, Scarborough and Thornhill. ​Our projects includes homes, apartments, commercial complexes and industrial facilities. We are committed to providing high quality roofing installations and replacements, honest evaluations, fair pricing and 100% customer satisfaction. We are local Toronto roofers, specializing in the following flat roofing systems. Built-up roofing more often referred to as “tar and gravel” roofing are installed using several layers of roofing membrane made with asphalt, felt and bitumen. It is assembled in 3 or 4 layers of alternating ply membrane and tar, with the bottom sheet mechanically fastened to the roof deck or insulation. It is topped off with gravel, stones or other mineral to protect form weather and UV rays. Modified Bitumen is a standard roofing asphalt that is reinforced with fiberglass or polyester fiber matting. This makes for a strong, flexible and durable roofing membrane. 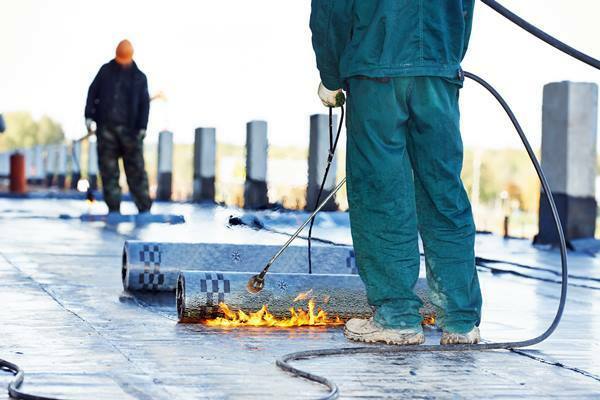 Modified bitumen is a 2-ply roofing system and can be applied using heat from a blow torch or with the use of cold adhesives. EPDM or Ethylene Propylene Diene Monomer is an extremely strong, durable and elastic synthetic rubber. In fact, it is one of the most long lasting commercial flat roofing systems in the market. EPDM is known to resist all types of weather from hailstorms to strong winds. It has superior resistance to fire and heat as well as withstand harsh ozone and UV radiation. Single-ply roofing membranes are compound synthetic sheets manufactured with increased strength, durability and longevity. They are often categorized as thermoplastics such as PVC (polyvinyl chloride) and TPO (thermoplastic polyolefin) and thermosets such as EPDM or Ethylene Propylene Diene Monomer. Each roofing system needs to be adhered and applied differently, whether mechanically fastened, with the use of heat or a number of cold applications. Regardless of the roofing system and application method used for your property, the most important aspect of an effective roof system begins with proper installation. Our team at Flat Roofers Toronto are composed of veteran Toronto roofers and highly skilled workmen that have the experience, expertise and determination to get each job done right. You can be confident that your roof will be installed in a timely fashion without sacrificing quality and integrity of your roofing system. Flat Roofers Toronto is dedicated to building flat roof systems that you can trust to last. Need an estimate? Feel free to fill out the contact form on this page or call us at 647-560-0376.